Leroy Meats and Catering began in the small town of LeRoy, Wisconsin in the late 1920's under the name LeRoy Locker. The store butchered, cut, and stored meat for farmers and made old world fresh and smoked sausage with recipes brought over from German immigrants, many of which are still made the same way today. Through the years many awards were won at the state and national levels including an international award in Ghent, Belgium. LeRoy Locker quickly became known as not only having the best sausage products in the United States but also in the entire world. In 1990 the business moved to Horicon, Wisconsin and updated the name to Leroy Meats of Horicon. The still family owned Leroy Meats continues the traditions of old but added many new products including over 60 varieties of brats in which we recently won the title of best brat in the state of Wisconsin 3 years in a row. 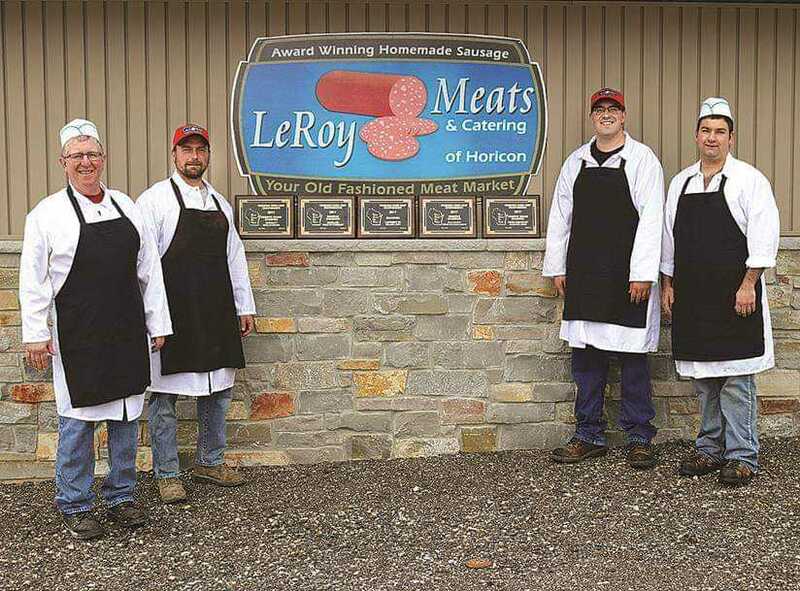 Leroy Meats has become known for nothing but the best meat and sausage products in the entire area and still selling at very competitive prices. Our full service catering staff is also on hand to serve small parties up to large weddings and gathering. All food is cooked from scratch and like anything else uses only top quality ingredients. Our newly expanded store in Horicon is open to serve you with friendly service and professional butcher who can specially cut and we even tell you how to cook. We at Leroy Meats want you to enjoy your experience here and are looking forward to serve you. With construction starting in Spring of 2017, we have now added another convenient location in Fox Lake, WI. This 11,000 square foot facility employes about 80 people and houses our inovative sausage making processes. We specialize in servicing you no matter the request. Call us and we'll be able to help you out. You have our personal guarantee on all the products we sell. Bring us your wild game and we'll show you how to cook it! Also enjoy some beer and wine samples! Page Summary: Leroy Meats of Horicon offers butcher shop, meat market, sausage makers and deer processing. Products & services such as sausage recipes, processing deer, catering events as well as retail meat are also part of the scope of our business. We also specialize in meat processing, meat companies in Mayville, Beaver Dam, Waupun as well as Fox Lake. Other areas we serve include Campbellsport, Horicon, Juneau and Watertown. We also service Hartford, Slinger and beyond.